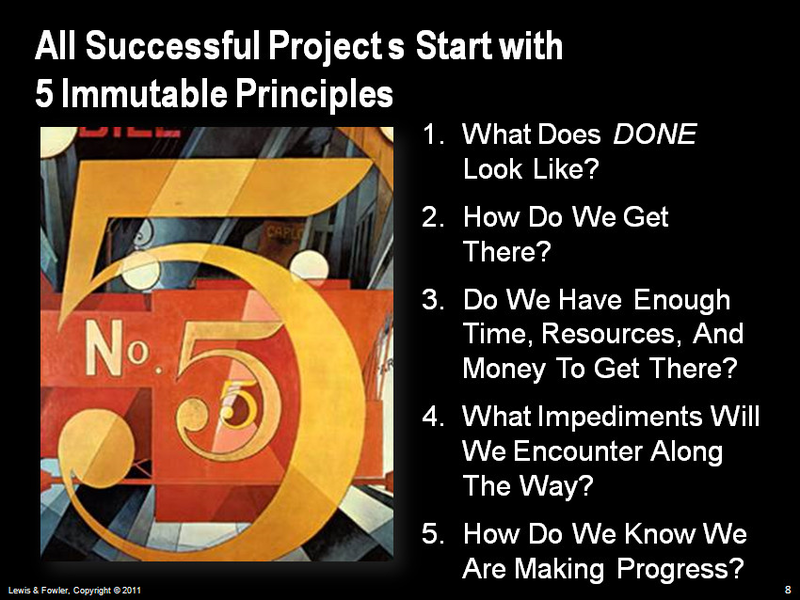 At QuantmLeap there was a recent posting of the 10 commandments of project management. Only there were actually 5 sets of 10, some 50 in all, albeit some duplication. And, to be clear, QL actually gathered four sets from other authors and then added the fifth. But for my money, there's something to be said for simplicity and clarity. Albert Einstein: "make is as simple as possible, but not simpler"
For my money, instead of 50 how about 5? This is the way Glen Alleman puts it, and the greatest of these is "Done". What does DONE look like? Hi John,I follow Glen very closely and am aware that he is very 'Done' oriented - and he's got my full respect for it. I am not taking my 10 commandments too seriously either, as it is nothing but a subjective list, but what is missing from Glen's list is the softer side of life - i.e. how to treat your fellow team members, how to communicate, etc. 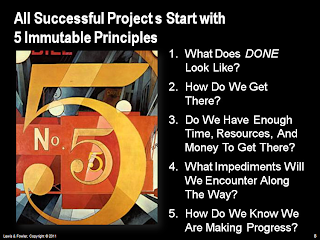 Yet, I can't but admire Glen for relentlessly reminding project managers (present company included) about the importance of these '5 immutable principles'. Shim: yes "relentlessly" is perhaps the best word!